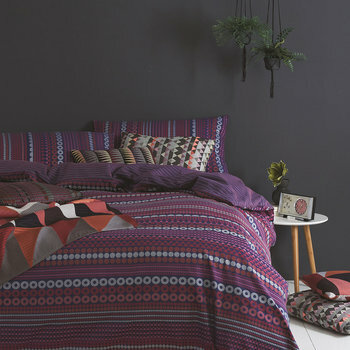 Margo Selby is an entrepreneurial woven textile designer who produces exceptional quality fabrics, rugs and accessories. 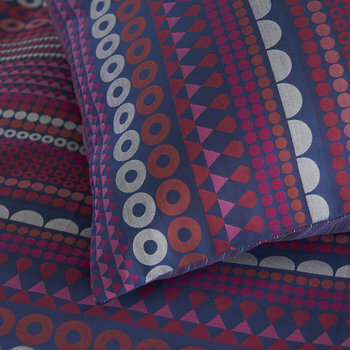 Following her graduation from the Chelsea College of Art and Design and The Royal College of Art, Margo received an overwhelming demand for her fabrics and began to develop relationships with weaving mills to explore the possibilities of production. Uniting her innovative hand-woven structures with industrial machinery, she created her first 3-dimensional fabrics that were to become the trademark of the Margo Selby brand. Connecting with materials in a hands-on way whilst making on a hand-loom allows a greater understanding of the construction and behaviour of the final product. Many of the fabrics designed by Margo are woven on Jacquard looms which allow for graphic imagery and pattern to be woven with articulation. Each striking pattern is created by a combination of rough sketching and precise drawing with the aid of computer design programmes. The handwoven structures are then applied to these CAD drawings and once the development is complete, the fabrics are put into production at one of the brand’s mills. Margo’s extensive training in woven textiles is central to all the design developments of the brand. Produced by specialist mills in a range of weights, they are suitable for soft furnishings and upholstery and perfectly complement both classic and contemporary interiors.